In the roaring twenties, Detroit fueled prohibition and an entrepreneurial spirit that didn't follow the rules. A century later, eight childhood friends started a small distillery to make alcohol the old fashion way. Detroit City Distillery creates small batch artisanal whiskey, gin and vodka using the finest local ingredients sourced directly from farms near our distillery and tasting room located in Detroit's famed Eastern Market. The result is a drink of distinction made for the revolutionaries rewriting the history of a great American city. Detroit City Distillery is now available in Chicagoland! We've proudly partnered with Heritage Wine Cellars LTD to bring our Detroit spirits to the Windy City. Stay tuned for all the details on tastings, cocktails and — of course — a good ol’ Detroit party in Chicago. Our philosophy behind our spirits is simple: we make what we want to drink. We make young, high proof whiskies to elevate the taste of the finest locally grown Michigan grains. We make experimental gins using the botanicals sourced just two blocks from our front door. Sometimes we even grow our own wheat for whiskey or pine for gin. This is what happens when farm boys turn city slickers and open a distillery in America’s oldest, largest public farmers market. After a long winter of mass whiskey consumption, we decided that we needed to drink more gin come summer. We turned into a gin joint for three months and had a damn good time doing it. We called it the “Summer of Gin.” Enjoy our inaugural 2015 small batch gin release until we make something completely different next summer. At Detroit City Distillery we consistently craft small batch bespoke spirits to experiment with distillation, ingredients and experience. These rare spirits may be made on a limited basis or one time only. Limited edition and experimental spirits can only be found at Detroit City Distillery tasting room. Omakase is a Japanese expression meaning “I’ll leave it to you” -- more commonly interpreted as Chef’s Choice. Due to the nature of the Eastern Market, we find ourselves with exciting, intriguing, fresh ingredients that change day to day. To embrace this, we offer an omakase option. Something of a gamble, you place yourself entirely in the bartender’s hands. at the historic home of Stroh's Ice Cream and Goebel Brewing Co.
We recently expanded to the second location we call “The Whiskey Factory” to make as much craft bourbon and rye as humanly consumable. The Whiskey Factory, a long-dormant building at 1000 Maple, located just off Gratiot Avenue between Downtown Detroit and Eastern Market, is the last remaining structure at the site that largely defined Detroit’s brewing legacy. Brewing at the site goes as far back as the 1930’s when Goebel Brewing Company built a massive brewery to compete with Stroh’s Brewery, Detroit’s largest brewery at the time. The breweries were located directly across the street from one another. Shortly after Stroh’s acquired Goebel’s in 1960s the building was converted to a factory to produce Stroh’s ice cream, a successful business created out of necessity during the days of Prohibition when producing alcohol was illegal. Today, we're reviving the long history of alcohol production at the site that started it all. Participants will learn about the art and science of the distilling process from grain to glass. We'll taste new and aging whiskey under development in the rack house. We'll talk history and sample a range of spirits including vodka, gin, brandy and of course....whiskey. Chef John Manion, Executive Chef and Owner of El Che Bar (and Detroiter). Photos by Jude Goergen. DETROIT CITY DISTILLERY NOW AVAILABLE! It’s official. 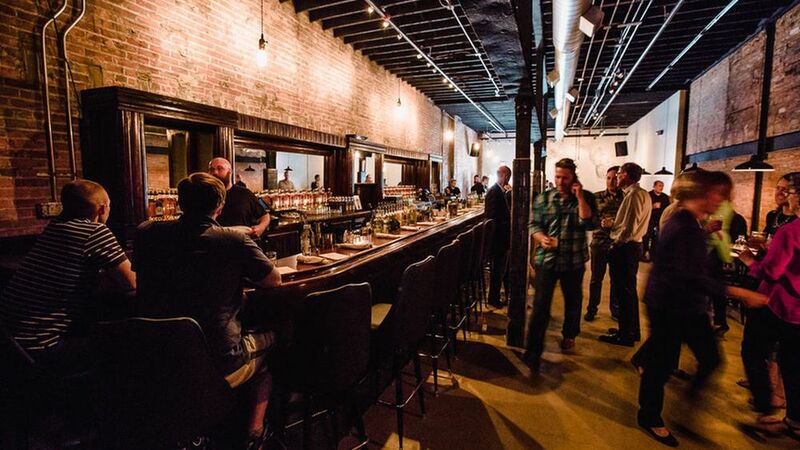 Detroit City Distillery spirits are now available in Illinois. We’re proud to announce our new partnership with Heritage Wine Cellars LTD to bring our spirits to the Windy City. Stay tuned for all the details on tastings, cocktails and — of course — a good ol’ Detroit party in Chicago. In the meantime, enjoy these beautiful photos from Chicago’s favorite industry photographer, Jude Goergen. SOLD OUT: Limited Edition Bottle Release. Thanks to everyone you enjoyed our “Bespoke Bourbon Series,” a celebration of the origins of craft whiskey. Three limited-edition single barrel bourbons with unique mash bills featuring Michigan grains and bottles adorn with hand-drawn illustrations were released over the course of three months. And of course they sold out immediately. Enjoy! The first release is “Smoked Bourbon.” This bourbon has a mash bill of corn and rye from Dexter Mill and features oak-smoked 2 row barley malt from Pilot Malt house of Kent County. It was aged for 2 years in a 30-gallon white oak barrel. This beautifully balanced spicy and smoky whiskey is inspired by our love of drinking around the campfire. The next release is “Four Grain Bourbon,” a celebration of the diversity of Michigan agriculture, with a mash bill of corn, wheat, rye and oak-smoked two-row barley. The most complex of the three bespoke bourbons, this whiskey has a slight smokiness with notes of vanilla, toffee and orange. The third and final release is “Red Bourbon,” featuring our Butcher’s Cut Bourbon finished in a red wine barrel. After aging for over two years in freshly-charred white American oak, we finished our signature bourbon in a cabernet-merlot wine barrel from Fieldstone Winery in Rochester. Hints of plum and berries shine through this bourbon, with soft, subtle tannins complimenting rich notes of caramel, hazelnut and cigars. We're bringing back the whiskey that started it all.... Bloodline Whiskey. Join us as we celebrate our 4th anniversary with a new American whiskey inspired by a great American City. Whiskey tastings, specialty cocktails, food pairings and live music all night. We sell everything we make from our Tasting Room and Whiskey Factory located in Eastern Market: Butchers Cut Bourbon (750 ml and 375 ml), Homegrown Rye Whiskey (750 ml and 375 ml), Railroad Gin (750 ml and 375 ml), Gilded Age Vodka (750 ml and 375 ml), and 6 unique small batch gins (750 ml). Stop in and take home Detroit's finest locally made spirits. Detroit City Distillery is proud to be carried by the finest purveyors of craft spirits across Michigan. The map below features some of our favorite independent grocers and liquor stores. You can now pick us up at Kroger stores across Michigan and all metro Detroit Meijers! Looking for a taste of Detroit from afar? The nation's leading online distributors of premium spirits distribute our products in 42 states. Click on any of the stores below to cure your insatiable thirst for Detroit's finest whiskey, gin and vodka.